For all those readers who asked…here is a whole-wheat Christmas cookie recipe! Now even though these are made with 100% whole-wheat flour please know they do contain some refined sugar (in both the cookie and the icing). I do occasionally post recipes made with refined sugar because, in my opinion, a cookie that’s homemade from scratch is far better than the factory-made version (or something like a “slice and bake”). And Christmas just wouldn’t be the same without cookies for Santa! In a medium-sized bowl whisk together the flour, baking powder, and salt. Set aside. In a large bowl fitted with an electric whisk cream the butter and sugar together for several minutes. While the mixer is going add the egg, cream, and vanilla until thoroughly combined. With the mixer still going on low, slowly add the flour mixture until well mixed. Turn off the mixer and squeeze the dough together into a ball using your hands. Using a rolling pin roll the dough out onto a floured surface until it's about 1/8 inch thick. 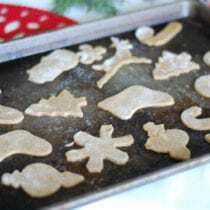 Use cookie cutters to cut desired shapes and place them onto an ungreased baking sheet. Bake in the oven for 5 - 7 minutes or until golden brown. Immediately transfer to a cooling rack (if you have one) until cool. Meanwhile, use a fork to mix together the powdered sugar and heavy cream in a medium sized bowl. 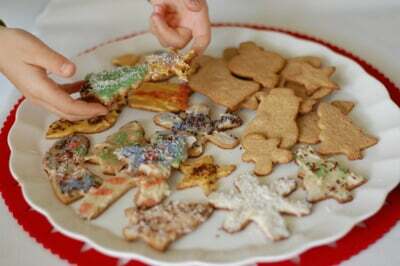 Top cookies with a thin layer of icing and other decorations if desired. Why don’t you just use Sucanat? It’s a fabulous replacement for refined sugar! We mostly use raw honey, but for baking we use Sucanat (which is an unrefined raw cane sugar) and it turns out perfectly! How long (days) can the whole wheat (without icing) crackers stay good at room temperature? How do you consume after freezing? The same question for the whole wheat muffin recipe too , how do you consume muffins after freezing? 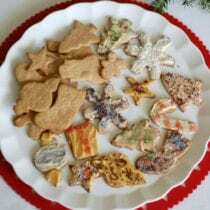 I made cutout Christmas cookies this morning too! Christmas just wouldn’t be the same without them. For the colors, I use raspberry puree for red (pink) and liquid chlorophyll for green. Chlorophyll, of course, is what makes plants green. You can find it in liquid or powder form in the vitamin section of your favorite natural food store. My Whole Foods didn’t have any sprinkles :( And Austin isn’t getting a Trader Joe’s for a couple of years – BOO!! I mad pink icing for my daughter’s birthday last week with beet juice (from a can of beets) and it was perfect. And carrot juice made great orange icing at Halloween. Love this alternative refined sugar free recipe. I’ll tell you what NOT to do with your kids. “Let’s make Christmas cookies with white frosting this year, Santa loves white frosting.” My boys wouldn’t buy that one! The trick is to do cookie shapes that are naturally white. We made snowflakes with white frosting and white snowflake sprinkles and snowmen with chocolate chips for eyes, mouth and buttons and a sliver of dried apricot for the nose. Next year I plan to try dying my own sugar with cranberry juice. I find Tree of India’s food coloring/colored sugar to be so muted, its not worth the exorbitant price. We were on a budget this year when it came to our holiday desserts so we had to be a little creative when it came to decorating our cut-out cookies while avoiding artificial colors. We definitely couldn’t afford the natural dyes and even the bags of hard candy (to grind up) were a little spendy. What we ended up doing was getting a package of naturally colored candy canes (to grind up for sprinkles) and everything else was stuff we already had on hand. We used coconut flakes, Enjoy Life chocolate chips (in whole form and also ground up to a sprinkley dust) and ground up cashews. We also added cocoa powder to some of our frosting so we had white (in both vanilla and peppermint) and brown and sometimes we piped the frosting on in designs. Honestly, when all was said and done, the cookies were far tastier than just colored frosting or colored sugar toppings would have been and we had just as much fun being creative and decorating. I think I was the only one who missed the colorful cookies (thanks to years of tradition). 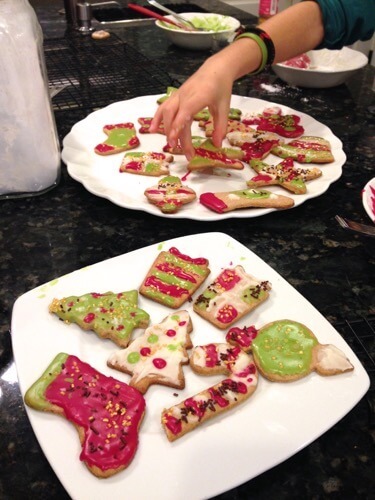 Our 7 year old didn’t care at all that the cookies weren’t vibrant and colorful. He was just excited to get to add chocolate! I too loved reading this! Food coloring/smoloring! I’ll bet your end product looked marvelous!! Wish I would have seen this recipe sooner, but I will definitely book mark it for next year! Very sweet picture! We used freeze dried strawberries blasted in the blender to make a nice red powder. Mixed in with regular icing, it turned a prety pink. We have done blue/purple with butterfly pea flowers. Easy easy, the water runs blue/purple when you boil them. So glad to see more moms like you embracing the natural food colors. We’ve been experimenting with them, too and have moderately good results. Great idea about the natural dye! Thanks for the post. I also use refined sugar sparingly…I just make sure that’s it’s “cane sugar”. Otherwise it’s most likely GMO (from GMO sugar beets). 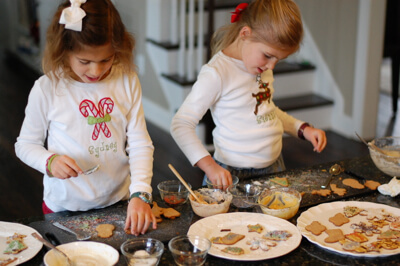 So fun to bake with those beautiful little girls. Those cookies look absolutely delicious…I’m going to use the recipe for New Year’s. My little girl will love it. For natural dyes, I find using grape juice, cranberries (boiled with water and strained) and even coffee grounds can work. We just use a natural recipe for the frosting, then divide it into smaller sections to add the dye. It’s fun and healthy! For our annual Halloween sugar cookies I used Sugar in the Raw this year. I put it in y magic bullet to get a better texture for cookies. They turned out great! The recipe is in the link below. I am so excited that I get to be in charge of our classroom cookie decorating for the Valentina’s party. That means homemade cookies and icing vs store bought with food dye. Do you think the icing can be made ahead of time (a few hours before the party) and refrigerated? I was thinking about storing it in big zip locks, then at party time, squeezing onto each of their plates to spread on the cookies themselves. What do you think? I’m wondering if anyone has tried making these thicker like those soft, thick store-bought frosted sugar cookies that are so tasty but oh so bad for you…? I’m planning to make some guitar shaped cookies for my son’s birthday party in a couple weeks and would love to use a whole wheat recipe, but we like the nice thick and soft ones. I came on here hoping you had a Christmas cookie recipe! So glad you do. I love the minimal amount of sugar. I think I will try this raw coconut sugar I just bought. I also love the suggestions for alternate food colouring. I never thought to just use coloured real food. I’m going to experiment pureed beets, all-natural raspberry jam and real juice. Thanks for the ideas. I will try these. I am horrible with cut out cookies, though. They ALWAYS turn into a goopy mess when I roll them out and when I attempt to place than on the cookie sheet. I may try using some of the coconut sugar we got recently. It is organic and it comes from the nectar of coconut flowers… It has a caramel flavor to it. Our Vanilla was a gift made from soaking the vanilla bean in vodka. SO GOOD! If you are looking for clean seinkles and candies they can be found online with a google search. Maybe you could go splits with some like-minded friends to get the more desirable candies and sprinkles at a lower cost. And if you are splitting the order, you won’t have tempting leftover candies around the house, either!!! Merry Christmas! Would this recipe work in a cookie press? Hi, do you think milk could be used in the place of cream? Thanks, love the site! Can I make these early and freeze for Christmas? If so, how long do you think they’ll hold up – refrigerated and frozen? I made these last year when the recipe was first posted, and everyone loved them! I made them again today with my 4 year old son, and he had a great time helping me. Wonderful afternoon activity for snow day #3, plus Christmas cookies for Santa are checked off the list! Do you think these would work with coconut oil instead of butter? Can plain Greek yogurt be used in place of the heavy cream? I saw it on another website that it may work as a substitute, wasn’t sure if it works or not. Thank you! Hello Becky. Hope these turned out for you. For future reference, you could try a little softened cream cheese with whole milk. Just whole milk will work, too, but it will have the consistency of a glaze vs a frosting. These are delicious. After a while, we ran into a little trouble transferring the cookies to the sheet and then I remembered a trick my mom taught me…to put the dough back in the fridge for a bit to get cold again. Worked great. We didn’t even ice them and they were perfect as is, though we’ll try it again just for the fun of decorating. Thanks for another great recipe! I made these with my little girls today and they are so delicious! such a hit. do they need to be refrigerated with the heavy cream in the frosting? thanks! Just made these and they are delicious! Finally a good sugar cookie recipe with good ingredients! My kids love them! Do they need to be refrigerated since the icing has cream in it? Awesome recipe! I think I can win my hubby over with these. Yes, this isa 5 star rating! I haven’t got any heavy cream, what could I possibly use to sub? Are there multiple options? Does anyone have any suggestions for modifying these to be chocolate flavored? Should I just throw in a handful of cocoa powder? Any info would be appreciated, thanks! So I’ve been looking all over for a whole wheat/real food hamantaschan recipe for the Jewish holiday of Purim. These worked perfectly! I subbed coconut palm sugar for the white sugar, the cookies come about a bit darker, but tasted delicious. I put chocolate chips in the middle of half and all fruit apricot jam in the others. Will organic sugar work or does it have to be the refined stuff? Organic sugar IS refined, it’s just grown organically. And if it’s organic, it should be non-GMO, although I guess there’s still some debate on that point. So organic sugar is a better choice than conventional, but still an ingredient to be used/consumed sparingly. Hi there. Sure, you can freeze them. Kids enjoyed them, but the wheat flour taste doesn’t taste right in a sugar cookie! Do you think if I roll this out thicker (say 3/4″ – 1″) they’ll be soft sugar cookies? I’m looking for a softer sugar cookie instead of the crispier style. Do you think these cookies would ship well? Hi there. While we’ve not shipped these, I think they will ship fine. Thanks for this! So excited to try them. I’m intolerant to wheat, so I’m going to attempt making these with gluten free oat flour. Any advice on making that work? I replaced the whole wheat for oat in the pumpkin muffin recipes and they were a HIT. :) Wondering if this will work as well? Hi Lillie. Sorry, but that is not something we have tried. These were great. I had a real hard time rolling out the dough which seems to always be a problem with me and a rolling pin so i just rolled them out on parchment paper and baked them right like that. Does this frosting get hard to make the cookies stackable? Will pure cane sugar work? Shouldn’t the dough be refrigerated for a time before rolling it out? This dough is sturdy enough without refrigeration. Great, not to sugary, reminded me of a whole wheat shortbread a bit. They are good on their own, but the frosting helps add a bit more sweetness. Can I make these using a regular hand mixer? I don’t have the big one that sits in the bowl. Thanks! I had put mine in the freezer for a few minutes because it was too sticky.